The ship was built in Gdansk (Poland); commissioned in 1981; obtained the name of Oslyabya in 2006. In 1985-1986 and 1990-1991 the ship was deployed in Indian Ocean. In 1986 it took part in evacuation of Soviet citizens from Yemeni port of Aden. 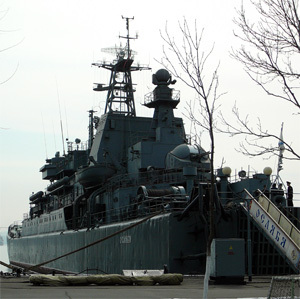 In 1991 the ship participated in evacuation of Soviet citizens from Nokra Island (Ethiopia). In 1996, 1997, 1999 it delivered cargo to Kamchatka peninsula. In November 2000 the ship's seamen sent complain to Pacific Fleet HQ about permanent derisions of warrants and petty officers. Vladivostok Military Procuracy initiated a criminal case based on the fact of non-administrative behavior. The ship is under repair.